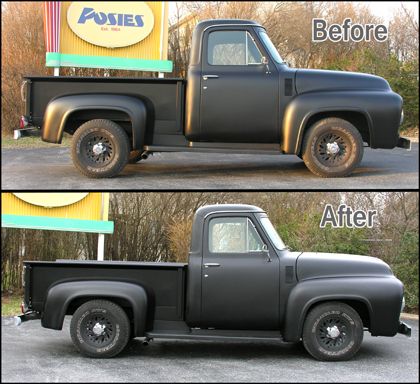 When it comes to Classic Truck Springs, POSIES SuperSlide Springs, has you covered!! We offer Stock Height Replacement Springs or Lowering Springs so you can drop your Ford, Chevy, Dodge or any make of truck. POSIES SuperSlide Lowering Springs will drop your truck approximately 3″ Front and Rear. For lowering the front of Early Fords and Chevy Trucks, we incorporate our two leaf Dual-Flex Technology. This is comprised of two tapered leafs, which after almost 3 years of development, offers the smoothest and safest riding drop front springs for trucks. For other makes and years we offer our traditional SuperSlide Springs which are desgined around a multileaf spring pack that incorporates Super Slide Buttons at the leaf tips to reduce spring friction and provide an outstanding ride. Click on the below link for photos of various trucks with POSIES lowered leaf springs installed. Lowering the rear of your Classic Truck is relatively straight forward. Remove your stock springs then install POSIES SuperSlide Springs along with any replacement hardware and enjoy the ride. You will see an approximate 3″ drop out of the springs along with a must better riding and stable spring. SuperSlide Springs are designed around a multileaf spring pack that incorporates Super Slide Buttons at the leaf tips to reduce spring friction and provide an outstanding ride. Each spring pack is designed specifically for your year model truck. We make springs for all trucks, Ford, Chevy, Dodge, Plymouth, etc…….